This large 720m square metre home built on the shores of the North Shore in Auckland was inspired by homes on the American North Eastern coastline. The home consists of four bedrooms with attached bathrooms and a self-contained apartment with bedroom, bathroom and living room which is housed above the spacious triple garage. The open plan living areas, which include a large conservatory, all face out to the stunning views that are afforded by this beachfront location. Large expanses of glass maximise both the views and all day sun. It was important that the selected colour palette would work harmoniously with the ocean view of subtle blues and greens, as well as working with the lush landscape which envelopes the home. The colours were chosen to create a relaxed atmosphere in the large and very detailed home. The intensity of the colour is varied as you move through the home. It was important to the clients that the use of bold and subtle colours were varied depending on the space they were to be used in. The main living areas are finished in Resene Powder Blue (antiqued steel blue) from the Karen Walker Paints range, which contrasted beautifully with the Resene White Pointer (stark off-white) which was used on the door trims and ceilings. 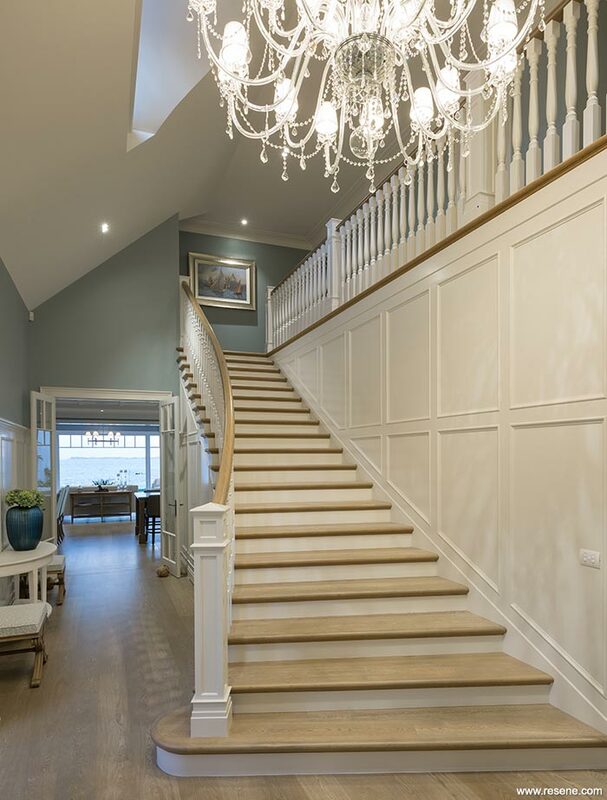 Resene Hermitage (stony blue green) was used in the conservatory to create a calm and airy feeling, while Resene Ivanhoe (slate blue) was chosen for the games room to contrast with the rich grey stained timber panelling. In the main bedroom and retreat Resene Tiara (duck egg grey) gives a more romantic feel. 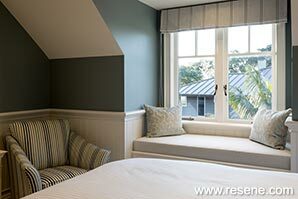 A combination of Resene Rolling Stone (mossy grey) and Resene Lynch (grey blue) were used in the other bedrooms. These colours, although varying in intensity, flow seamlessly throughout the home. The intricate detailing of the panel work, stair balustrading and built in cabinetry called for meticulous attention to detail from the painter which was achieved beautifully. Walls are painted in Environmental Choice approved Resene Zylone Sheen low sheen, with Resene Enamacryl gloss waterborne enamel on trims. The exterior is finished in Resene Lumbersider low sheen for its easy application and performance. This home by Masonry Design Solutions Ltd won the Resene Total Colour Residential Interior Colour Maestro Award 2016. The judges thought “drawing inspiration from the beautiful beach positioning, the sea is gently washed inside with weathered tones of blue and white.